Rector’s Profile: BA, Juniata College, Huntingdon, Pennsylvania, 1980. M.Div. Episcopal Divinity School, Cambridge, Massachusetts, 1984. D. Min. program (in process) Drew University, Madison, NJ. Ordained Priest, March 30, 1985, Episcopal Diocese of NJ. Curate, St. Peter’s Episcopal Church, Perth Amboy, NJ, 1984-1987. Rector, Holy Spirit, Lebanon, NJ 1987-present. Chaired various Diocesan ministries including but not limited to: Liturgy and Music, Vision Making(current), Standing Committee, Diocesan Council, Insurance, Architecture. 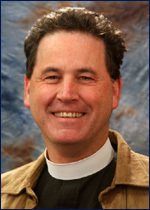 Faculty, Episcopal Preaching Foundation, 2005-2008. Member of AP Council- Associated Parishes for Liturgy and Mission (associatedparishes.org). Addressing the epidemic of Autism in NJ, was Executive Director from 2006-2010 of The Uncommon Thread, Stirling, NJ, creating and developing an early intervention center for autistic children. Weekly priest visitor, 2006-present, Community of St. John Baptist, Mendham, NJ. Philip was born and raised in Metuchen NJ, married (1982) Janmarie Carr of Florham Park, NJ. Janmarie is a high school teacher. They enjoy their three children - all recent college graduates: Casey, Austin & Victoria.